finishing equipment, Quorum offers a wide range of print products. need an e-book, we can create one at the same time as the print version at little extra cost. once your brochure is printed, it can go on line as an e-brochure. Catalogues. Everyone likes to leaf through a catalogue, with purchases being made by phone or online. 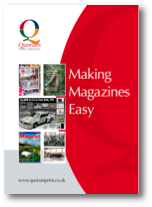 Quorum has a long history of catalogue printing. basic marketing tool. Quorum can design yours economically, and print them quickly. service makes life easy for publishers and editors. are some of the solutions offered by Quorum. boards or in frames, eyeletted and hemmed, or fitted into simple-to-use roller banner stands. is important to get it right for the intended purpose. Quorum produces many types of folder each month. effective option for short and medium runs. planning and with all production facilities located in-house, Quorum can squeeze deadlines to the limit.